Celebrations have been blooming around the country in honour of Canada’s 150th Birthday, and we’re all abuzz! What’s going on in the gardens this summer? 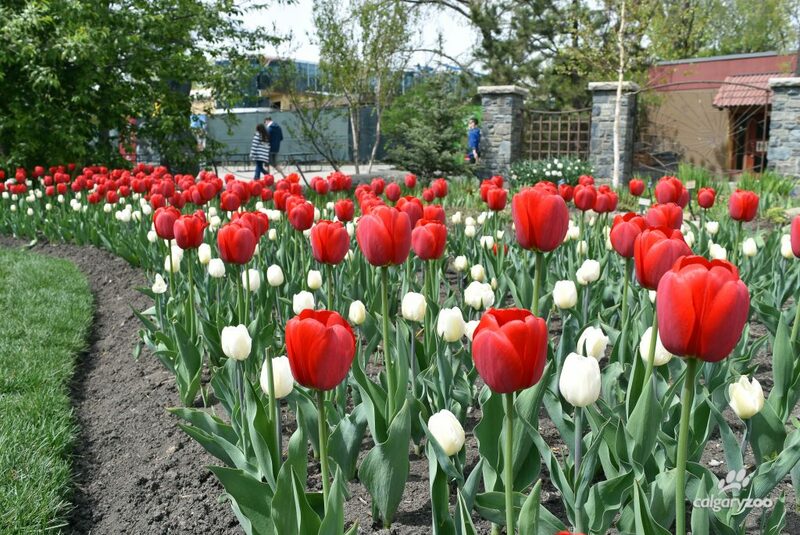 Embracing the official Canada 150 tulip, the Calgary Zoo has joined the thousands of Canucks celebrating the occasion by planting white and red tulips in their gardens. The Dorothy Harvie Gardens are famous Calgarian botanical gardens, so horticulturalist Corinne Hannah seized the opportunity to have its flower beds show off a little red and white pride. The flower beds surrounding the entrance to the ENMAX Conservatory have been transformed by tulips, and recent sunshine has allowed them to flourish. 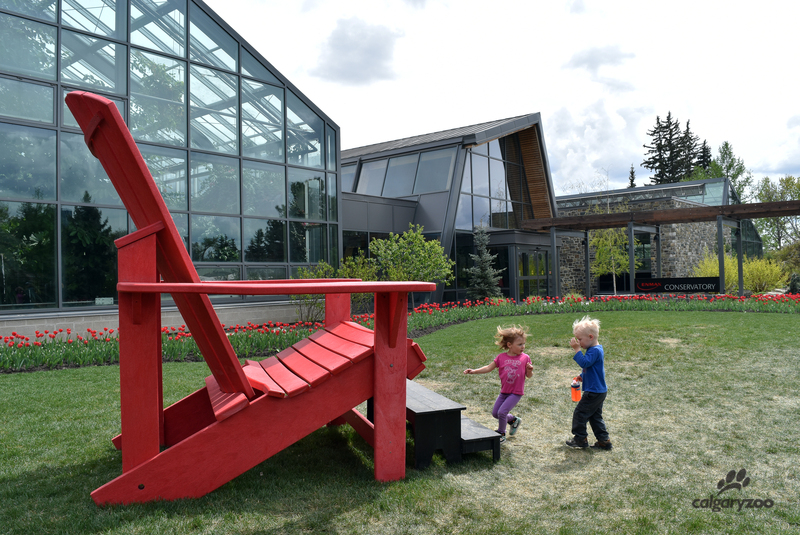 This photo op is enhanced by a giant Adirondack chair has been positioned on the conservatory lawn – a perfect location to share your #Canada150 memories. 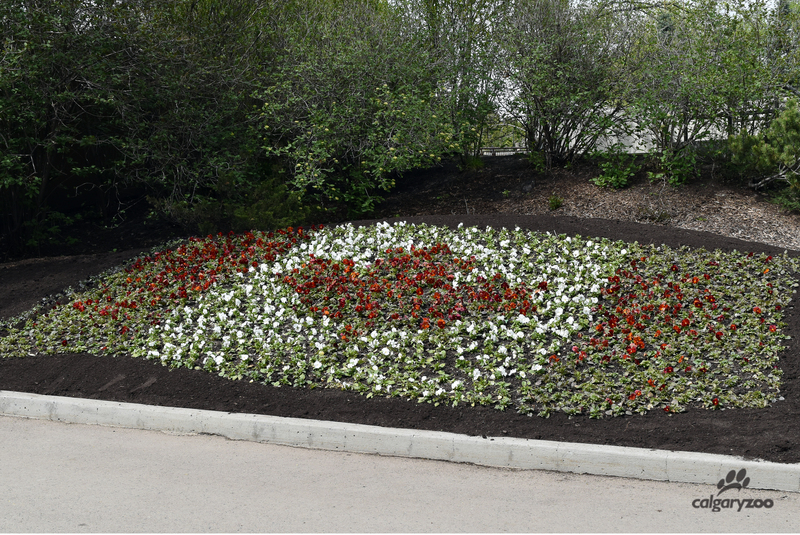 In case the colour scheme isn’t enough for your pictures, another garden bed nearby is truly flying the flag for these Canadian celebrations. Oh Canada! We’re flying the flag for the 150th birthday- even in our gardens. These patriotic beds aren’t the only ones with a great story, as this year we’re reviving our pollinator garden! What’s the buzz? Gardens like these are vital in the effort to protect bees and butterflies, whose numbers are dwindling. Our Horticulture team is working hard at putting the final touches on our own pollinator garden across from Grazers. We’re including native plants that are uniquely suited to our local pollinator friends. Although small, gardens like this can be mighty in helping to curb the decline. Whether you’re at the zoo to enjoy the animals or the gardens this season, don’t forget to keep an eye out for a little Canadian spirit. We <3 our gardens! THERE ARE ONLY TWO DAYS LEFT TO VOTE FOR THE #GreatestCdnAnimal!